On June 8th, 2015, among other tasks on an unremarkable workday, I sent an email to economist Samuel Pessôa, a researcher at the Getúlio Vargas Foundation (FGV). 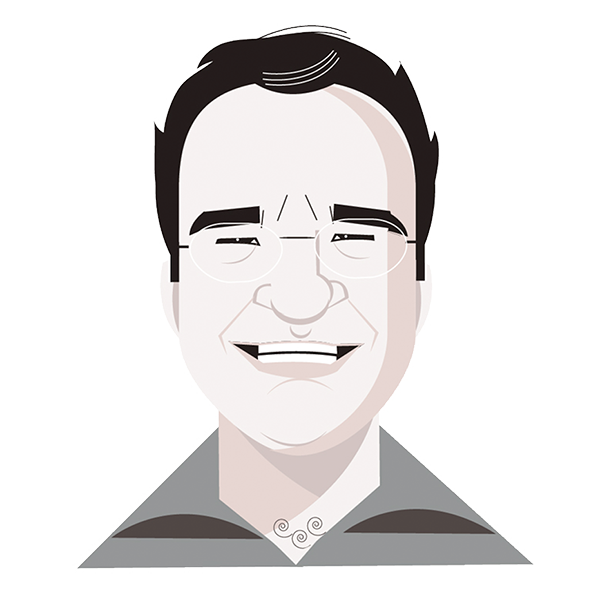 In the message, I returned to a conversation we’d struck up two years earlier: I wanted to know what else he could tell me about an American economic historian whose ideas he had mentioned emphatically and effusively on more than one occasion. The man’s name was Nathaniel Leff. Pessôa, with a bachelor’s and master’s in physics and a doctorate in economics from the University of São Paulo, has a penchant for topics in economic history. When asked about some contemporary problem, his arguments and line of reasoning almost always turn to long-term dynamics and historical circumstances. A question about the job market and unemployment figures, for example, can lead him to speak at length on the effects of slavery and 19th-century immigration on inequality in Brazil. The conversation about Leff had begun that way – and piqued my interest. Despite my best efforts, I had run up against all sorts of difficulties in finding any more information about this apparently little-known professor. All that I knew about him – and hence my interest – was his academic work. In early 2013, at Pessôa’s suggestion, I had read a book of Leff’s on the Brazilian economy in the 19th century. Underdevelopment and Development in Brazil, originally published in 1982, was actually a collection of essays written years earlier, modified and published in a single volume. Over the late 1960s and early 1970s, some of Leff’s articles had appeared in the most prestigious journals of economic history and economy. These were periodicals such as the Journal of Economic History, in which the ideals and formal models produced by economists began to be applied to the study of the past, the American Economic Review, the Journal of Political Economy, and the Quarterly Journal of Economics, which shaped the history of the discipline and still figure in the dreams of researchers across the world. Milton Friedman, Friedrich Hayek, Paul Krugman, and Joseph Stiglitz, all Nobel Prize winners, presented some of their most important ideas in the pages of these publications. Google searches for Leff’s name bring up links to his texts and information about the place where he taught for nearly three decades, from the late 1960s to the mid-1990s: Columbia Business School, in New York. Below the search box there appears a list of books, articles, and essays. Hardly anything else. It is difficult to find any other sort of record of him. There is nothing indicating the date and place of his birth, his family, where he studied, his having taken part in public events, tributes paid by friends, parties, or photos. The impression is that of someone who vanished before the Internet, at some point between the mid-1990s and the early 2000s, cast its painstaking net over every aspect of our lives. It wasn’t hard to understand Pessôa’s enthusiasm for Leff. In his essays, the American researcher had put forth hypotheses that were both rigorous and imaginative in an attempt to tackle the two main problems in Brazilian economic history: why we wound up as a relatively poor country, with low per capita income, and why our society is so unequal. One of Leff’s ideas was that Brazil, over the course of nearly five centuries of history, had become a machine for producing “cheap” people: an abundance of under-qualified, low-cost laborers. These laborers had been imported from Africa against their will, for the most part. But that wasn’t the whole story. Important political and institutional frameworks – such as restrictions on access to land, in the 19thcentury, and incentives towards the immigration of little-educated European laborers – were put forth so that the mechanism could keep running smoothly even after the end of slavery. Unable to easily buy a small lot of land to cultivate, workers arriving in Brazil – or those who were already there – had few alternatives beyond selling their labor on the cheap. This was radically different from the American experience, which had produced the inverse: abundant, cheap land available for recent immigrants, and thus workers who were relatively “expensive.” In order to retain laborers, those who owned industries or land had to offer a wage at least equal to what those laborers could earn on their own small farms. Compared to the country’s abundance of capital (in lands and machinery), labor was scarce in the United States, and salaries were high. Leff’s analysis was completely different from the approach found in the classic works on the “economic formation” of Brazil from Caio Prado Jr., Celso Furtado, and Fernando Novais. Instead of looking for the sources of the country’s “backwardness” in its relationship to Europe – in the commercial exchanges that allegedly benefited the metropolis to the detriment of local landowners – the American author called attention to problems within Brazil’s economy and decisions by the political elite that kept per capita income low and inequality high. What seemed incomprehensible was why, despite the intrinsic value of the essays he produced and the explicit recognition he received from the most important publications in economic studies, with their almost unfailing ability to structure debates in the field, Leff’s ideas ultimately received little attention in academic circles in Brazil from the late 1960s to the early 2000s. Many of those texts, written over 40 years ago by a reclusive professor at Columbia University, had never come to the attention of most Brazilian researchers. Pessôa himself claimed to have never heard of Leff’s work during his undergraduate studies at USP. He came across it by chance in the 2000s, during a conversation with André Urani, an Italian economist living in Rio who died in 2011. The next day, Pessôa bought two copies of Underdevelopment and Development in Brazil. He offered one to his friend Marcos Lisboa, then secretary of economic policy at the Ministry of Finance under the first Lula administration. Lisboa said that he read the book enthusiastically at night, after he got off work. Historian and economist Renato Perim Colistete also discovered Leff around the same time, in the mid-2000s. Colistete is 53, with a boyish face and a calm air, with a quiet, gentle tone. A professor of economic history at the University of São Paulo, he recalled having found references to Leff’s work by chance, when he began researching the 19th century in Brazil. “His influence on economic historiography is still very small; he’s not an author who is used in courses on economics, or history for that matter,” Colistete remarked in his office at USP, in August. This is changing, albeit very slowly. Colistete himself recommends essays by Leff in his classes. Eventually, he came to have a greater appreciation for the Columbia professor’s research. In the 2013 book Desenvolvimento Econômico: Uma Perspectiva Brasileira, a collection of essays from a number of specialists, Villela took the chapter on Brazilian economic history from 1500 to 1945. At the end of his article, in a note on “recommended readings,” he names three authors “for those interested in the historical roots of the socioeconomic formation of Brazil”: Caio Prado Jr., Celso Furtado – and Nathaniel Leff. In the mid-1990s, without so much as a word to his colleagues and friends at the university where he’d spent his whole career, Nathaniel Leff disappeared from the halls of Columbia Business School. Hardly anyone there would hear from him again. One of the few people with whom the Brazilianist spent time with at the business school and outside it was his Israeli colleague Gur Huberman, who teaches finance there. “I was a friend of his,” Huberman – a young-looking, slim 64, despite his completely white hair – told me when I met him in the faculty lounge. Huberman said he spent at least one Shabbat at the house Leff shared with his wife in a suburb of New York. When his first daughter was born in the early 1990s, Huberman was away from the university, working for J.P. Morgan. Even so, he insisted on taking his daughter, then just a few months old, to Columbia so that his friend could meet her. Despite their closeness, he also lost contact with Leff after 1995. Hugh Patrick remembered hearing around that time that his colleague was in poor health – and that that was the reason for his sudden retirement. “We knew that there was some illness. I don’t remember whether he told me what it was, at the time. Mostly, he didn’t make a big deal about it.” Huberman also recalled his friend’s having faced some health problem. After Samuel Pessôa’s email put us in touch, I wrote to William Summerhill, the professor at UCLA. He was quick to reply. “I came across Leff’s work in graduate school and met Leff himself when I was doing my Ph.D. in economic history at Stanford, at a small conference in 1992,” he wrote back. Months later, I would meet Summerhill in São Paulo. He had come to Brazil to give classes at USP and at the Institute of Education and Research, or Insper, a private college focusing on economics and business administration. His thesis on the construction of railways in Brazil, published in 2003, is now considered a fundamental work on the Brazilian economy in the 19th century. Summerhill is 52 years old, tall and strongly built. He speaks nearly impeccable Portuguese, albeit with a typical American accent. Beyond his work as an economic historian, Summerhill was also a paratrooper and captain in the U.S. Army. He took part in ROTC during college, which guaranteed him a salary and financial independence from his parents. During training, he said, when they had to do jumps and spend multiple days in the wilderness, he’d take along the history books he was studying. “I’d jump out of the plane with The Social Origins of Dictatorship and Democracy, by Barrington Moore, Jr., in my pack,” he recalled. The economic impact of the railways – the topic that Summerhill, inspired by reading Leff’s works, would study in his doctoral dissertation – was a favorite topic in new economic history, the name of the “school” that wedded economic methodology to historical research. In the 1960s, the use of mathematical models and the manipulation of statistical databases to test out ideas about the past was made famous by a study from historian Robert Fogel on the effects of railway construction on the growth of the United States in the 1800s. In the United States, research on economic history had long highlighted the 19th-century Northern Hemisphere’s “transportation revolution” on both sides of the Atlantic. In his research, Fogel was building on a classic topic in American historiography, but with novel results. The building of better highways (used for transportation via mule and cart), the opening of canals, steamboat travel, and railway construction helped to connect a number of urban centers and small farmers in the former English colonies, driving economic growth. Better and cheaper means of transportation pushed down the cost of getting agricultural products and manufactured goods to the country’s main markets, with gains for both producers and consumers. It is difficult to imagine another measure with such wide-ranging effects on an economy. When transportation costs fall, the final price of the product, as paid by the consumer, can also drop. In turn, lower costs allow many more people to gain access to (and buy) transportable goods, padding the profits of farmers and manufacturers as well as investments and the scale of production. When we speak of the creation of domestic markets – or even of globalization, which starts with the great voyages of the 15th century and takes on new force with the steamboats of the 19th century – that indicates, above all, the connections being established between a greater number of markets using cheaper, more efficient means of transport. Improved means of transportation also contributed to the increase in specialization and productivity in the American economy. Since it was cheaper to cover greater distances with loads of wheat and milk, for example, it was no longer necessary to produce both goods in the same region. A single area – with better soil for cultivating wheat, say – might specialize in grains, while another could increase its concentration of cows per square meter. The output of both goods would grow, and producers’ per capita income as well. What Robert Fogel showed in his article from the 60s, however, was that this entire transportation revolution was hardly dependent on railway construction. The United States’ excellent network of rivers and canals, to say nothing of the solid highways for transport on horseback, was able to connect much of the country. These means were not much more expensive than rail transport. If all the locomotives and train cars in circulation in the late 19th century were taken out of circulation – and their loads transferred to boats and carts – the impact would be minimal. “You’d lose the equivalent of about two weeks of GDP, by Fogel’s estimates,” Summerhill told me in São Paulo. In Brazil, however, the story would be different. In his texts, Leff argues that the key to understanding why Brazil became a relatively poor country, with per capita income far below the levels reached by Europe and the United States, was to be found in the 19th century – no earlier, no later. But traditional historiography, which had produced the (still-dominant) narrative about the reasons for the country’s “backwardness,” tended to identify the colonial period and the relationships between Portuguese America and the capitals of Europe as the source of the country’s sluggish pace towards industrialization and development. It so happens that up until the Industrial Revolution at the end of the 18th century, economic development rates weren’t very different across the globe. The continuous gains in productivity that followed the adoption of the factory model were what allowed some countries to jump ahead and start growing at a much faster rate than others. It’s been estimated that the United States’ per capita income was similar to Brazil’s around the turn of the 18th century. By 1820, after industrialization had begun in the former British colonies, each American could boast twice as much income as a Brazilian. And in 1890, just 70 years later, per capita income in the United States was more than quadruple the figure in Brazil. Some of the arguments put forth by traditional historiography to show that the roots of the country’s “backwardness” lay in the colonial era, however, were solidly constructed. At least Celso Furtado’s arguments were. In his book The Economic Growth of Brazil, the economist suggests that for most of its history, Portuguese America was little more than an array of large farms that used slave labor to feed the external market. According to Furtado, the very fact that Brazil had been devised as “a huge plantation for tropical products,” dependent on Europe and with no economic logic of its own, would inhibit the development of a domestic market – and hence the development of the colony itself. The impressive wealth accrued by the sugar mills of the Northeast in the 16th century, Furtado wrote, could have led the sugar industry to double its productive capacity every two years. Even so, economic development in the surrounding area was paltry. In fact, the economist argued, much of that income “leaked” out of Portuguese America. Some of it went to loan payments to European merchants who had advanced resources for the construction of the sugar mills and the purchase of slaves. Part wound up in the hands of the slave traffickers who brought captives from Africa. Investments in machinery and labor, purchased outside of Portuguese America, thus had little impact on the local economy and failed to help it develop. Another portion of the income from sugar was spent on imported products – even luxury goods from Europe, such as wines. In this way, the growth of the sugar industry, the income from which might have benefited other activities in the Colony, failed to boost its peers. There was no “perceptible change in the inner structure of the economic system,” as Furtado puts it. The gains from the sugar mills did not translate into a more complex economy around them, and the country remained a cluster of farms focusing on exports, with a few sectors, such as cattle-raising, working to supply the internal market. From a social point of view, the economic logic described by Furtado made the free population engaged in other activities almost irrelevant. We were a country of a few masters and many slaves. Poor, free people had a supporting role, if that. For Leff, the causes of Brazil’s underdevelopment also lay in the difficulty that the domestic market faced in articulating itself and growing more quickly, thus creating a complex economy. But instead of pointing the finger at commercial relationships with Europe, he blamed the Brazilian economy’s lack of internal integration – and the high cost of transportation in the country. This is not to say that there was nothing being produced on the domestic market. On the contrary – since the 1970s, the Columbia professor had been suggesting that greater attention be paid to that sector, too often downplayed by traditional historiography. With no detailed information on hand, Leff argued that it would be reasonable to suppose that in the colonial period and the 19th century, most of the Brazilian population would have been mainly dedicated to agricultural production for internal consumption. The reasons he put forth for this were, above all, logical. The first trustworthy data on the importance of the external sector, from the early 20th century, indicated that total exports for the country came to 16% of everything produced in Brazil in 1913 – the rest went on the domestic market. It was impossible for this gigantic chunk of the economy to have emerged overnight and not have existed in the 19th century, Leff reasoned. Moreover, even in the areas focusing on exportable goods, slaves never represented the majority of the population. Large landowners, meanwhile, were a tiny fraction of Brazilians. Hence, far from being reducible to the dichotomy between masters and slaves, most of Brazil’s population was free. And poor. What were all these people – who weren’t plantation owners, didn’t produce exports, and weren’t slaves – doing? That was what Leff wondered. An answer emerged at the turn of the 1990s. Historians João Fragoso and Manolo Florentino, professors at the Federal University of Rio de Janeiro, offered a new interpretation of the functioning of the colonial economy, based on brand-new empirical research. They showed that the production and circulation of goods within Portuguese America was much more sophisticated and complex than had been previously thought, at least at the close of the colonial era. Brazil’s economy had economic cycles of its own and relative autonomy from the fluctuating prices and demand for the main products exported to Europe – that is to say, the territory wasn’t all that dependent on the sale of sugar, cotton, and coffee. Fragoso and Florentino also uncovered a vast flow of mule drives and business connections tying together the southern reaches of Minas Gerais, São Paulo, and Rio de Janeiro from the end of the 18th century to the start of the 19th, commercializing local production. Into the ports of Rio flowed loads of charque (jerky) and wheat from Rio Grande do Sul, manioc flour from Bahia and Santa Catarina, and corn and beans from Rio and São Paulo. The authors also mentioned the existence of a great swath of the population engaged in producing for the domestic market – free and relatively poor people who did not own large numbers of slaves. Finally, in a blow to the traditional interpretations of the economic formation of Brazil, they showed that one of the main channels allowing the income of Portuguese America to “leak” out simply didn’t exist. The slave trade, the most profitable enterprise of the time, was concentrated in the hands of traffickers in Rio and Salvador. In addition to buying and selling African men, women, and children, they were veritable bankers in the colonial period and the start of the Empire, advancing resources for farmers and boosting production. Some of the hypotheses proposed by Leff in the 1970s had thus just been confirmed. But the American author isn’t cited by his Brazilian colleagues; nor does he mention them in his work from the 1990s. 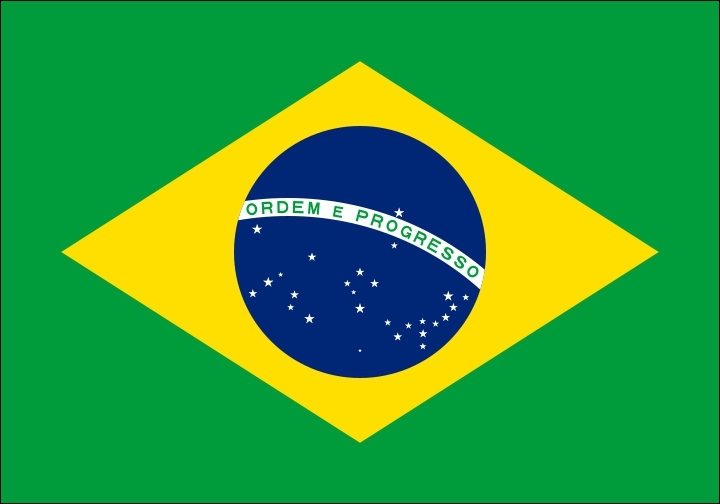 In order to explain the lethargy of the Brazilian economy in the 19th century, one had to explain why the most important economic sector in the country – production for the domestic market, whether of agricultural or manufactured goods – grew at a much slower rate than comparable systems in Europe or the United States. Given the very nature of this sort of production, the explanation couldn’t be sought out in external trade. In fact, it was precisely in internal commerce, and in the trying state of transportation and market integration within Brazil. Unlike the United States, Brazil lacked a good network of navigable rivers along which to move its products. Nor had the nation built canals or solid highways that might facilitate the circulation of goods. Road conditions were so poor, Leff writes, that “wheeled vehicles could seldom be used in the interior.” Geography didn’t help, either. Nearly everything sold in the Southeast, for example, was transported on the backs of mules over the arduous mountain ranges of Minas, São Paulo, and Rio. It was extremely expensive to move cargo and products around the country, which stifled the growth of domestic production and the economic gains to be had by the small farmers and ranchers who made their living that way. The same difficulties faced those who had to take their products to the ports in order to sell them outside the country. “Transport costs were so high that they absorbed a third of the value of coffee shipments during the prerailroad era,” Leff wrote. Finally, and no less importantly, the limits on market integration and farmers’ profits imposed by challenging transportation also made it nearly impossible for the country to industrialize. “Low income levels and high costs for transporting goods to the hinterland limited the size of the market for manufactured goods in Brazil,” in Leff’s analysis. In this sort of situation, not even protective tariffs meant to shore up demand for domestic products could help. “Industrialization based on the internal market clearly required the prior emergence of a domestic market,” Leff added, not without some irony. When the railways finally began to be constructed in the mid-1850s, everything changed: the internal market swelled, as did agricultural production, and the country finally industrialized. Much of the railway network was implemented to meet the needs of major exporters, of coffee in particular, in São Paulo. Even so, the effects of introducing train transportation for domestic goods were striking. Data used by Leff and William Summerhill show that along the three main “coffee railways” in São Paulo, the share of cargo taken up by products other than coffee – mainly manufactured goods and foodstuffs – kept on growing from the late 19th century to the turn of the 20th. This reached such a peak that these products went from making up a minority of transported goods to reaching 60-90% of total cargo on those three lines by 1910. All signs seemed to indicate that Leff was right, and one of the key reasons for Brazil’s “backwardness” in the 19th century was the lack of economic integration caused by the high costs of transportation. Moreover, flying in the face of the classic historical narrative, there seemed to be no competition between the advance of exports and the development of the domestic market and industrialization. It was precisely a push from the products headed for the ports – coffee, above all – that made it possible to overcome obstacles to the growth of the economy as a whole. As railway networks spread across the country, going from around 1,000 km of track in the early 1870s to 26,000 in 1914, and with the subsequent fall in transport costs, they “reduced the prices that consumers paid for merchandise, increased the prices that producers received, improved the mobility of labor, boosted output and income, and laid the groundwork for pivotal structural shifts that came about in the first half of the twentieth century,” Summerhill wrote. Whereas trains hardly made a difference in the United States, with its great network of rivers and canals, in Brazil the railways were responsible for finally making the country grow. At age 79, historian Herbert Klein remains one of the great specialists in slavery and the Atlantic slave trade to the Americas. After teaching at Columbia, where he even wrote an article along with Leff, he moved to Stanford. Over the phone, despite repeated call drops – “sometimes the connection here in California is bad”– he told me that he had sought out the economic historian Stanley Engerman, who also knew Nathaniel Leff, after Summerhill wrote to him. Engerman, also 79, is one of the greatest working economic historians. Along with Fogel – the researcher who measured the impact of the railways on the American economy in the 19th century – he wrote a study of slavery in the American South. Leff had a good sense of humor, he said. He liked to crack jokes and was often ironic – a description that contrasted with the impressions of other colleagues and friends, who emphasized the Columbia professor’s introspective bent. “We couldn’t find the date of his death, but I’m sure that he’s dead. He was never seen again. I think he died at home with his family at some point in the ’90s, probably in 1995,” Klein said. Stanley Engerman, whom I spoke with next, also remembered Leff well. A professor at Rochester University, he lives outside New York but has family in the city. In the 1970s he used to travel there, and often had lunch with his colleague in economic history. After Summerhill had written to them, when they tried to turn up information about Leff, Klein and Engerman believed they had found the answer to a lingering question about their colleague’s academic career. According to Klein, his friend had had an impressive trajectory, especially for a Jew of his time: undergraduate at Harvard, master’s at Columbia, and a Ph.D. at MIT. “I always wondered how he’d been able to get into Harvard,” Klein commented. According to Klein, Leff, at two years younger than he, must have been born in 1938 and – more importantly – entered Harvard in the mid-1950s, a period during which the most traditional university in the United States still maintained limits on the admission of Jews. In the book The Chosen, sociologist Jerome Karabel, a professor at Berkeley, explains how the intricate present-day system of college admissions in the United States – with the attention it pays to characteristics unrelated to pure academic performance, such as “character,” “leadership,” and involvement with extracurricular activities – emerged at the start of the last century as a way to bar Jews from entering Harvard, Yale, and Princeton. The traditional Protestant elite in the United States, Karabel writes, saw itself as threatened by the influx of immigrants into the country, especially those considered somehow “inferior.” When those people moved to take advantage of the expansion in American secondary schools (which more than tripled from 1900 to 1920) and started occupying the traditional redoubts of white Anglo-Saxons, steps were taken. University administrators, Karabel explains, were also under pressure from the market: when some universities began admitting large numbers of Jews, they saw Protestant students favor other institutions. Afraid of losing its largest donors, Harvard introduced an undeclared “quota” of 15% for new Jewish students. By the 1950s, the hurdles had been somewhat reduced, but they were still present. The change, according to Engerman, stemmed from the fact that shortly after the Second World War, “it was hard to be on the same side as Hitler.” He and Klein discovered, however, that Leff must have secured a place at the college by virtue of having graduated from one of the most traditional high schools in the country, the Boston Latin School. “Coming from Boston Latin,” the bosom of the Anglo-Saxon elite, “probably made it easier for him,” Engerman said. The two researchers also had a more satisfactory answer as to the reasons that might have led that brilliant Harvard student to take an interest in Brazil. In the early ‘60s, when Leff was working on his master’s at Columbia, there came a flood of money for those looking to study Latin America. Those years in the wake of the Cuban Revolution brought an unprecedented number of incentives for the training of specialists in the region. Few people have done more for Latin American Studies in the United States, Klein said, than Fidel Castro. At Columbia, in the early 1960s, a new generation of Brazilianists began to emerge. One of the pioneering scholars of the country, Charles Wagley, was a professor there. According to Klein, Wagley must have been important for Leff’s “conversion” to Brazil. “He’s always thinking about the United States,” Renato Colistete told me with his habitually calm air, in his office at the University of São Paulo. He explained that many of the questions that Leff posed about Brazilian economic history stemmed from comparisons to the American experience, which he knew well. One of those issues had to do with the value of work and income distribution in both countries. Since the colonial period, but particularly so in the 19th century, workers’ income had been high in the United States. Labor was expensive, even in relation to Europe, and economic inequalities at the time were relatively small. This was the case because there was a shortage of workers in North America, in a sense, and their price was rising. There were many people there, of course, and many others were streaming in, with immigration from Europe – but these new workers didn’t necessarily need to sell their labor to land- and business owners. They might move west and take over unoccupied land, complete with good access to means of transportation – rivers, workable highways or railways – and easy routes by which to commercialize their output. After 1862, with the passage of the Homestead Act, those who had occupied a piece of land for over five years became the legal owners of it, even if they hadn’t been born in the United States. This meant that workers would only turn down the income that a small property integrated in the market might provide if the salaries offered by large farms or business owners made it worthwhile for them. That made it difficult to attract and hire new laborers – and salaries rose. In Brazil things didn’t happen that way, as Nathaniel Leff observed in more than one article. What surprised him was the fact that, in theory, the countries might have had similar experiences. Land was also abundant in Brazil. But unlike in the United States, labor was cheap. The explanation for the difference lay in the fact that these new lands to be occupied in Brazil were not, in practice, as vast as the size of the territory might suggest. What was missing – Leff insisted – was cheap transportation able to connect the farms in the countryside with centers of consumption. The cost of moving merchandise and agricultural products on the backs of mules was high, and distant lands revealed themselves to be less than profitable or altogether economically unfeasible. Besides all that, after 1850 new barriers were erected to land access in Brazil. In that year, every piece of ground that wasn’t registered or yet in use became the property of the State. And it could only be transferred to new owners if they bought the land directly from the government, with money up front – a serious hurdle for the most of the free, poor population as well as for the immigrants arriving in the country. Those coming in – and there were plenty of them – had few options. They might try to occupy lands with little value, far from major markets, with high transportation costs and low profit margins. Or they could sell their labor cheaply to those who already had land. It remains odd that a neoclassical economist – using models and quantitative methods which part of the left in Brazil still considers intrinsically conservative – should have turned his gaze to the historical roots of low per capita income and Brazilian inequality. That problem, moreover, had not been at the center of the debate on the economic formation of Brazil – the focus had remained more on relations between Brazil as a whole and Europe. “That’s my father, yes,” said the person on the other end, after a brief pause. He was speaking from a small city in New York State. “Definitely, yes,” insisted Avraham Leff, 53, the warm, polite son of Nathaniel and Judith Leff. With a Ph.D. in computer science, he works as a researcher at IBM. Before I could ask my next question, Avraham said that yes, his father was alive, although not in good health. “Unfortunately, he’s been fighting Parkinson’s for about 25 years. He’s really not in any shape for an interview, I’m afraid to say,” he added. “Of course, I understand,” I said, before explaining to Avraham in greater detail what I was doing and how I had found him. After I had spent some time searching for Leff online with no success, a friend familiar with the story – and better with search engines – brought good news. The young Brazilianist Flora Thomson-DeVeaux, a Ph.D. student at Brown University, told me that reproductions of the consular records authorizing the Leff family’s entry into Brazil, filled out in October 1963, could be found on the Internet. One of them bore the full name and date of birth for Avraham, which made it easy to find his telephone number in the United States. And yet, in the small photograph on the diplomatic document authorizing his entry into the country, Leff shows none of the features commonly associated with religious Jews. Not a hint of a beard, and no kippah. I put this to Avraham. “Yes, it makes sense,” he said. “A while ago I was looking at my father’s reunion picture and a picture of him at Harvard. Had I not been told that was my father, I wouldn’t have known. He was totally clean-shaven, no hat, no nothing. This was America in the 50’s, where you didn’t rock the boat if you didn’t have to.” According to his son, Leff only let his beard grow out after he got tenure. We spoke for a while longer, and he mentioned the difficulty his father had communicating. He had to make a tremendous effort when he wanted to say something. Leff was almost always lucid, and could understand what was said to him, however. I wanted to know if Avraham knew, in detail, what had led his father to want to study Brazil. He wasn’t sure. “I would have to ask him. Thank God I still can ask him that sort of question”, he added, before saying goodbye. “Hello,” said the female voice on the other end of the line, in heavily accented English. At age 80, Judith Leff, Nathaniel’s wife, is three years older than he. Born in Austria, she moved to France as a child with her family, in the 1930s. They were trying to flee from Nazism. Like her husband, she is quite religious, and a woman ahead of her time. In the 1950s, she completed a doctorate in biology at the University of Paris. Her specialty is plant physiology; she is an exceptionally intelligent, cultured, and stoic person. Nathaniel, Mrs. Leff told me, was born in New York. He was part of the third American generation of a family of Polish immigrants. His father, Louis, was a Wall Street trader. Zelda, his mother, was a high school teacher. At some point they moved to Boston. She also knew that Nathaniel had spent some of his adolescence – perhaps no more than a year – in the recently created State of Israel. It was there, some time later in the 1960s, that the two met. Judith was doing her Ph.D. research – “I was doing the laboratory work for my thesis” – at the Hebrew University of Jerusalem. Nathaniel was spending another year in the city, having finished his studies at Harvard. A few months later, however, she got a call from Leff. He wanted to know if he could visit her in France over his break. They got engaged in Paris. He went back to the United States. Six months later found him back in Europe, along with his family, for the wedding. Judith left everything behind and went to live with her husband on the other side of the Atlantic. 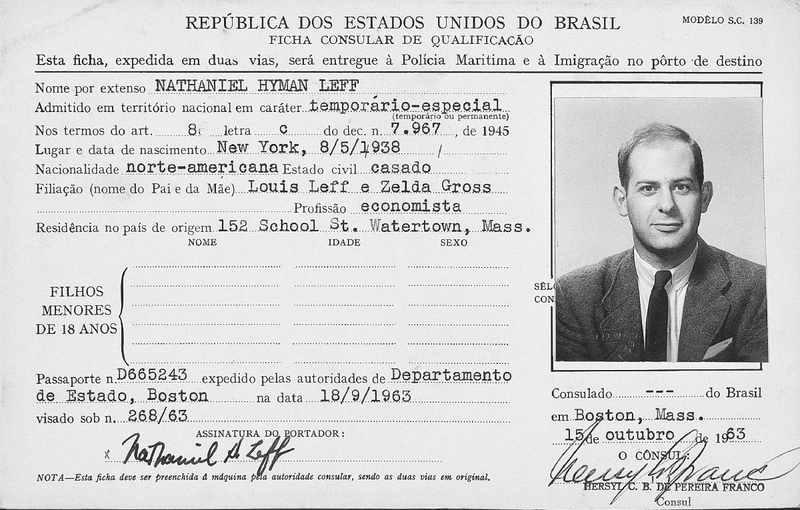 It was in this period, between 1961 and 1963, that Nathaniel Leff took a definitive interest in Brazil. His adviser at Columbia, Judith said, was economist Albert Hirschman, a specialist in economic development who was studying Latin America at the time. Even so, there seemed to be a decisive moment at which Leff finally made up his mind to write a dissertation on the Brazilian economy. As Judith recalls it, her husband was already interested in Brazil at the start of his master’s, and wrote his thesis on the Brazilian economy as well. But records at Columbia show that Leff devoted his final project to the economy of Algeria, perhaps due in part to his mastery of French. Near the end of his time at Columbia, Leff decided to learn Portuguese. He told Judith that they were going to move to Brazil, where he would do research. She couldn’t recall details about this apparent swerve in focus, but said that her husband spoke with her about Brazil and how the country fit into his interests as an economist. “He was interested in economic development”, she said. “And he thought the best place to study it was South America. Brazil was very interesting in the sense that he wanted to know why the developments of Brazil and the United States were so different. He was fascinated by that.” Moreover, Judith explained, her husband had also heard that there was a large Jewish community in São Paulo, and this also swayed the balance. In late 1963, two years after Judith had left France, she and Nathaniel set off for Brazil. They took with them their two children – Avraham, 14 months old, and Anne, at just three weeks. They liked Brazil. “I loved the language,” said Judith, “the people, the scenery, the relaxed way of life.” They moved to a tall apartment building near Avenida Paulista, which brought one inconvenience: on Saturdays, in observance of the Sabbath, they had to go up and down the 20 flights of stairs on foot. Leff kept in close contact with Brazilian economists. Judith remembers having Delfim Netto, a young professor at USP who would later become Brazil’s finance minister, over to their house for dinner. Delfim Netto also recalls his brief overlap with the American. Another who met Leff at the time was Affonso Celo Pastore, the former president of the Brazilian Central Bank, who was studying under Delfim at the time. As far as Judith Leff can recall, her husband never went back to Brazil after his brief stay of just over a year. The first signs of Parkinson’s disease appeared when Nathaniel Leff was 50, in 1988. The diagnosis, Judith said, came two years later. “Things got progressively worse,” she said. Soon Leff found it difficult to control his tremors, the involuntary movements of his limbs and head, and to speak. Around 1995, hope emerged. There was a doctor in California, Mrs. Leff said, who had developed a new method for treating Parkinson’s. Articles were published in the New York Times and the Wall Street Journal. The researcher was putting electrodes on patients’ brains, identifying areas that controlled certain movements – rather, the areas that made certain movements uncontrollable – and then, according to Judith, interrupted neural connections, making the tremors stop. “We decided we’d go for it,” she said. The two traveled to California, Leff was operated on, and it worked. The involuntary movements stopped. “He was symptom- free.” The surgery worked perfectly – for a week. After that, the worst of the tremors never came back, it’s true. But Leff practically lost his voice. Judith has no doubt that her husband’s turn for the worse stemmed from the experimental procedure. And he doesn’t just have difficulty talking. When he finally does manage to say something, the noise he makes is muted and very difficult to understand. Judith described her husband’s frustration as he tried to communicate with others. There was no way around it. The Columbia professor decided to retire. “I don’t think he was what I would call a real Brazilianist,” economist Werner Baer, a professor at the University of Illinois, said of Nathaniel Leff. Baer is one of the most influential specialists on the Brazilian economy in the United States. In a way, given the recognition he has earned both in the U.S. and Brazil, given his ability to influence the debate, the dialogue he has always kept up with the Brazilian academy, Baer is a sort of anti-Leff, the forgotten economic historian. Curiously, their paths crossed in the 1960s, when both were beginning to study Brazil’s economy. Strangely enough, even Leff’s enthusiasts might say that Baer and Paiva Abreu’s critiques are not misplaced. At the time that he was writing his most important articles about the Brazilian economy in the 19th century, between the late ’60s and the early ’70s, Nathaniel Leff – or any other researcher, for that matter – did not, in fact, have both abundant and trustworthy data for the period. On the contrary. The available information was strong enough to back up a rough sketch reconstructing the period, at the most. And so Leff worked principally with economic logic, evaluating the consequences of the abundance or scarcity of various factors of production – land and labor, above all – and social and political decisions that affected availability and the relationship between said factors – such as means of transportation, incentives for immigration, land legislation, demography, and education. Criticisms and praise aside, the type of method preferred by Leff – which brought a Nobel Prize in Economics for Robert Fogel, who advocated for the use of quantitative methods and economic models in historical research and measured the impact of the railways in the United States – was never broadly adopted, nor did it take root in Brazilian academia. Over the 1970s and 80s, according to Claudio Haddad, the former director of Brazil’s Central Bank and the founder of Insper, a number of Brazilian researchers trained in the United States wrote dissertations involving economic history, coming to master the relevant theory and quantitative methods. But they didn’t follow up on their research when they returned to Brazil. Some were drawn to other research areas, and others went on to make their careers outside academia. In his tiny office at FGV in Rio, with bookshelves covering every square inch of wall, André Villela argued that the hybrid discipline to which Leff, Summerhill, and Haddad had dedicated themselves wound up stranded at some point between historians and economists. History departments, he said, don’t teach the statistical techniques and mathematical formulations used in economics. “A guy like William Summerhill, a historian with a mastery of economic methods, would be much less likely to emerge in Brazil.” Among economists, meanwhile, what wins out is the desire to build a body of knowledge with universal validity, independent of historical circumstances. “Hello,” said Judith Leff with a timid smile, as she opened the door of her house in the small city of Passaic, New Jersey. From Manhattan, it’s no more than half an hour by train. Out the window, over the course of the short trip, one sees a predominantly industrial landscape – silos, warehouses, truck loading zones – and suburb after suburb, all similarly rich and well-maintained, with their calm tree-lined streets and picturesque two-story houses with roofs of various colors – grey, red, beige. Passaic would be just another little city on that secondary train line if it weren’t for the station, apparently simpler than the others – just a shelter with a pitched roof and four wooden benches – and the fact that most of the residents are Orthodox Jews. The Leffs’ two-story house is white, with the window frames and other details in green and a steep gray roof. A wheelchair ramp was installed over the few steps leading up to the main entrance. Mrs. Leff, who had just opened the door, was wearing a skirt that went below the knee, black shoes, and a purple blouse. She invited me in. Just behind her in the living room, sitting in a leather recliner before the fireplace, was Professor Nathaniel Leff. He wore a black kippah, black pants and shoes, and a white-and-blue checked shirt, and had a generous white beard. His legs were stretched out on the chair’s leg rest, his arms contorted and held close to his body. With his right hand he managed to hold a white hand towel, which he used at times to wipe the corner of his mouth. Judith introduced me to Nathaniel Leff and invited me to take a seat on the couch. He greeted me with some difficulty: “Hello.” Mrs. Leff called in a nurse – a powerfully built black woman – who helped to lift him into a wheelchair. We went into the adjacent room, where the three of us sat at a dinner table covered with a simple tablecloth, with a tall vase of five massive sunflowers as the centerpiece. I talked about Brazil and said that I admired his writings. The retired Columbia professor smiled, satisfied. He gazed fixedly in my direction. I asked if he had ever gone back to the country after 1964. Leff was slow to respond. Judith intervened, reiterating the question. The economist, apparently making a great effort, murmured a few words – incomprehensible to me. I looked to Mrs. Leff, who didn’t seem to understand what her husband was saying either. I knew, of course, that the reason for that visit wasn’t to interview Leff. It wouldn’t be reasonable – or kind – to expect satisfactory answers from a man with considerable difficulty speaking, due to Parkinson’s. Even so, I tossed out a question as to the reasons he’d taken an interest in Brazil in the 1960s. He looked at me, pleased, and asked – with pauses between each word – “Do you want the whole story?” Hopefully, I said that I did. Another important question left hanging had to do with Mrs. Leff. The diplomatic form she’d filled out before entering Brazil indicated that she had been born in Austria in 1935. What did her parents do? And how had she survived the war? “My father was a painter,” she said. I wavered for a moment. What type of painter? “He was an artist,” cut in Nathaniel Leff from the head of the table, quickly and emphatically. Judith got up and fetched a photo of a self-portrait painted by her father. The portrait was striking and had an interesting style – it recalled Egon Schiele and German expressionism. Then Mrs. Leff said that, if I was really interested in the story, I ought to read a letter from her father to her mother that she had had framed, and which was in the other room. Born in the old Austro-Hungarian Empire, Judith’s parents had tried to hide in France after the rise of Nazism. But her father was arrested at the time of the German occupation, in 1940. He spent the first years of the war in a French concentration camp, one less harsh than the others – but from there, the Jews were sent by train to die in Germany or Poland. When he heard that he would be transferred to Auschwitz, Arthur, Mrs. Leff’s father, sent a letter to his wife. In it, he asked that his wife have faith in God and try to keep their five children together, under her protection, for as long as the war lasted. If that weren’t possible – and if she should be separated from the children – even so, she should remain alive, “even alone,” wrote the painter, about to be sent east. Ultimately, Judith Leff was separated from her mother and siblings during the war, just as her father had feared. They all hid in the homes of French families resisting the occupation. Although quite young from 1940 to 1945, Judith remembers the various families with whom she lived in the Loire Valley. Once the war was over, she went to live with an aunt in England while her mother fought in court to reclaim the apartment that had been seized from them. In 1948 the family was reunited in their old home, now restored. Arthur had died in Auschwitz. “Hello. Is he here already?” This was Avraham, greeting his mother. “How’s he doing?” he asked, referring to his father. The Leffs’ eldest child arrived at his parents’ house just after I had finished reading the letter from his maternal grandfather. We all sat down at the dinner table. Avraham also had a beard (shorter than his father’s, however, and graying) and also wore a black suit and a large kippah, which covered his head almost entirely. Nathaniel took advantage of his son’s arrival to ask to be placed back in the recliner. In the dining room, I asked Mrs. Leff about her husband’s Parkinson’s. “The first thing I noticed was that he had become depressed,” she said. Sometimes his arm hung in the air. They went to a neurologist. Judith said that when Nathaniel heard the diagnosis, he said he didn’t know anything about the disease. And what was more, he didn’t want to know. She was the one who spoke with specialists and took the necessary measures, armed with the knowledge of the probable progression of his symptoms. “He didn’t want to know, and he didn’t want anyone else to know. He didn’t want people to feel sorry for him,” she said. “He didn’t want compassion. He was very self-sufficient,” said Avraham, who had come back to the dinner table. He and his mother remembered Nathaniel’s insistence on driving long after he had been diagnosed. Later came the surgery in California, and the worsening of his speech problems. Judith Leff alluded to a farewell party at Columbia University – which should have happened, but, for some reason, didn’t. Her husband wound up leaving without saying goodbye to his colleagues. For a couple years now he’s had trouble paying steady attention to what is being said. Nor can he write, even on the computer. But there are moments when he’s “all there,” present and perspicacious, Judith explained. I told her and Avraham that many former colleagues lamented not having heard from him. Some even came to believe that he had died. “He was focused on staying alive, dealing with his disease,” Avraham told me. “He didn’t get any calls, either,” argued Judith. It was time to go. In the next room over, Professor Leff was awake and attentive. I leaned over him, took hold of his arm and thanked him for having met with me. He looked at me with a smile and said it was no trouble. I saw that he was wearing a watch – although he was clearly unable to check the time. Up close, his shirt looked brand-new. Only then did I realize that he and Mrs. Leff had dressed up to have me over. She took me to the door. The late afternoon was already terribly cold, despite the blue and cloudless sky. With the same grace with which she had received me, Judith Leff said goodbye and closed the door.